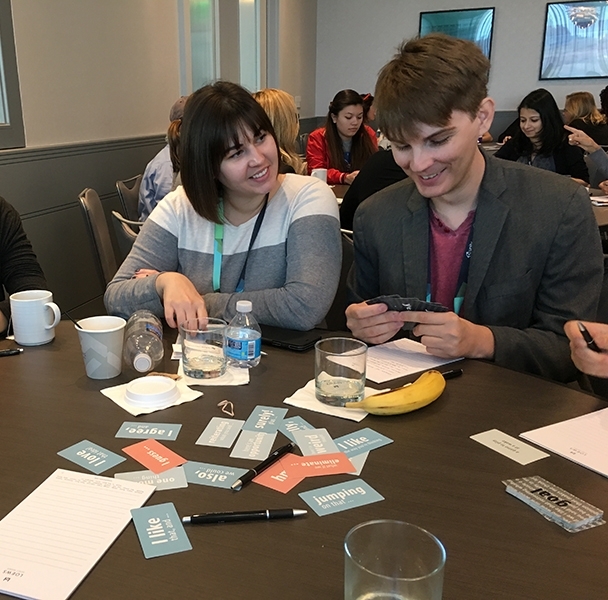 Yes, and… is an inclusive brainstorming game that designed by Tracy Fullerton based on best practices at USC Games. We often find that our students need practice with good brainstorming etiquette and this provides a fun and social way to do just that. It is based on the premise that how you brainstorm is as important as what you brainstorm. Good brainstorming etiquette means using language that is inclusive and creates positive exchanges of ideas between all participants. “Yes, and…” borrows it’s name from the classic improv exercise, but takes the exercise farther, to promote positive, inclusive interplay in all types of creative brainstorming. Players break into groups of 6-8 and deal out of the deck of “yes, and” cards. They choose a “goal card” that determines what the group will brainstorm about — these are intentionally somewhat silly or blue sky. Then the group uses the “yes, and” cards to engage in a lively, whirlwind brainstorm around the goal. The language on the cards leads them towards a positive, inclusive experience, however there are also examples of less positive, neutral and negative language that can be used, so that player can unpack the impact of this language on their experience and on the outcome of their brainstorm. The game is great for use in classrooms, meetings and anywhere that creative teams want to learn to work better together.